This series is compelling viewing and should be considered as required viewing at the high school level. 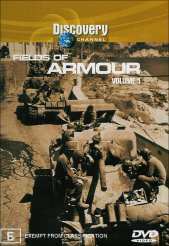 Put together by the Discovery Channel, Fields of Armour covers the invention of tanks and the part that they played in various wars as nations came to the realisation that mechanised warfare could be the turning point in their own conflicts. The disc is broken up into 6 easily digested segments covering different campaigns and time periods of World War I and II. Using a variety of photos and some incredible movie footage taken directly from the battlefields of both World Wars, we get to see the history of warfare and the devastating consequences of man versus machine. For the most part this disc covers things from the British and German viewpoints as World War II engulfed Europe and how Adolf Hitler wholeheartedly threw his support behind the Nazi development of tanks. There is some amazing archive footage of the dictator as he goes about his inspection of troops. Showing the history of the British Tank Corps (the British put the first armoured tank on the battlefield), the doco covers how slow and lumbering the machines were initially. Also members of the cavalry were responsible for trying to disprove that these machines were superior to their beloved horses. This disc is a must have item for budding historians and anyone with an interest in the history of warfare as it truly depicts a turning point in man's quest to find more effective ways to kill each other.